Types of documents which can be authenticated are Marriage Certificates, Birth and Death Certificates, Letters of Eligibility of Marital Status, Powers of Attorney, Parental Permission Slips, Foreign Adoption Papers, Authorization to Conduct Business in Foreign Countries, etc. 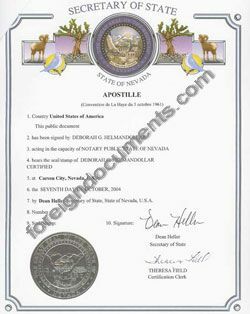 Documents notarized by a Notary Public commissioned in the State of Nevada. Certified copies of Birth Certificates [, and Death Certificates Marriage Certificates and Divorce Records, issued by County Recorder/County Clerk of the county in which the event occurred. Certified copies of corporation documents: Articles of Incorporation, Articles of Amendment, Articles of Merger, Articles of Dissolution, Certificate of Status issued by Nevada Secretary of State.